On Interstate 55 heading south from St. Louis into Missouri wine country, there’s a clever billboard from the Missouri Wine & Grape Board imploring drivers to “Shop Local, Sip Local.” But before there were “local” movements of any kind, there were pioneer Midwestern winemakers, like the Hoffmeisters of Sainte Genevieve winery, who made wine as a labor of love and continue to do so today. Sainte Genevieve winery was established in ’83 by Chris (Linus) and Hope Hoffmeister as the first post Prohibition winery in Southeast Missouri. Hope Hoffmeister, who often worked in the tasting room located in a historic house in downtown Ste. Genevieve, passed away in 2000. Only a year before Hope’s passing, the Hoffmeister’s daughter Elaine returned home after receiving a degree in enology from California State University Fresno, one of the leading wine making programs in the U.S.
During the time Sainte Genevieve has been in operation at least eight wineries have opened in the area, including Crown Valley, a large tourist destination winery with state of the art winemaking equipment. Despite all the changes and the growth in the Missouri wine industry, Sainte Genevieve grows grapes and makes wine in an unembellished style using mostly traditional methods and equipment. During a vineyard tour, Linus explains that while he can’t grow organic grapes in his 13 acre vineyard because of mold, he strives to use natural processes to manage the vineyard. For example, rather than use commercial fertilizers, every third year Linus lays down a mixture of cattle manure and lime compost in the vineyard. The manure comes from a local farmer and the ground-up limestone rock (mainly calcium carbonate) comes from a local mine. While this homemade fertilizer is more expensive than store-bought, Linus says it’s worth the cost. “The original farmers knew calcium was an important element for plants, just as important as nitrogen and phosphorous,” he said. Another example of natural materials is the cedar vineyard posts that were harvested from the property. Some of the posts are the same age as the vineyard, now nearly three decades old. 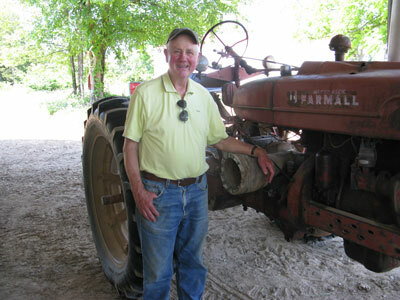 “The vineyard land has been farmed for 125 years and the topsoil is thin,” Linus said. A combination of thin soil, mature vines, and a broken sandstone substrate has so far minimized the impact of the severe drought for the Hoffmeisters this summer. An April 2012 frost ruined the Catawba crop but left other varietals in better vineyard locations unscathed, according to Linus. Elaine, the winemaker, said she prefers a “softer” style of winemaking that compliments her father’s grape growing knowledge and experience. “Our wines are made with a gentle process so the wine goes from the vineyard to the bottle to the customer in a natural way.” One aspect of Elaine’s wine making style is not doing any unnecessary racking or filtering so more of the fresh estate grown fruit comes through in the wine. Elaine says she uses an electric basket press instead of a bladder press because she’s found that the basket press produces more accentuated juice. 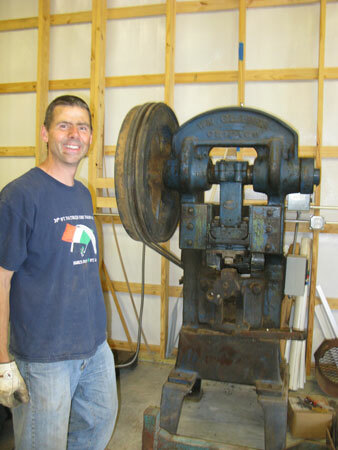 The Hoffmeisters are masters at maintaining and repairing vintage equipment and machinery . 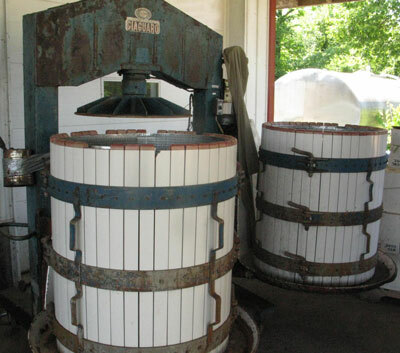 The basket press mentioned earlier was purchased in 1985 and has undergone several overhauls. 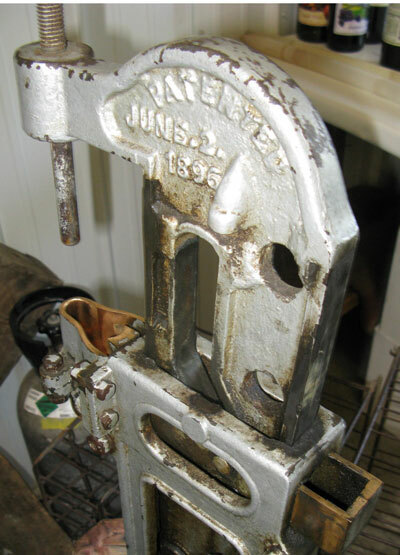 One piece of ultra vintage equipment, an 1896 bottle corker, is being retired this year and replaced with a modern Criveller monoblock block bottling line. “We’re going to have a retirement party for that old corker; we bottled 4,000 cases of wine with it this year and I kept praying that it would continue to work.” says Elaine. 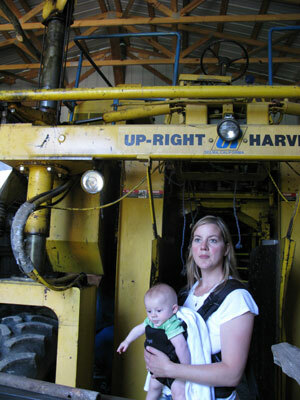 A working mother with three children, ages 4, 3 and 6 months, Elaine said that she looks forward to a less labor intensive bottling process. The ingenuity of the Hoffmeister family is also evidenced by Elaine’s brother Joe who has started a cooperage in a new building on the family’s farm. A former engineer at Anheuser Busch in St. Louis, Joe uses only Missouri white oak to make his barrels by traditional methods that use no screws and no glue. Much of the equipment in the new cooperage dates back to the early 20th century and was purchased from a local barrel maker who went out of business. 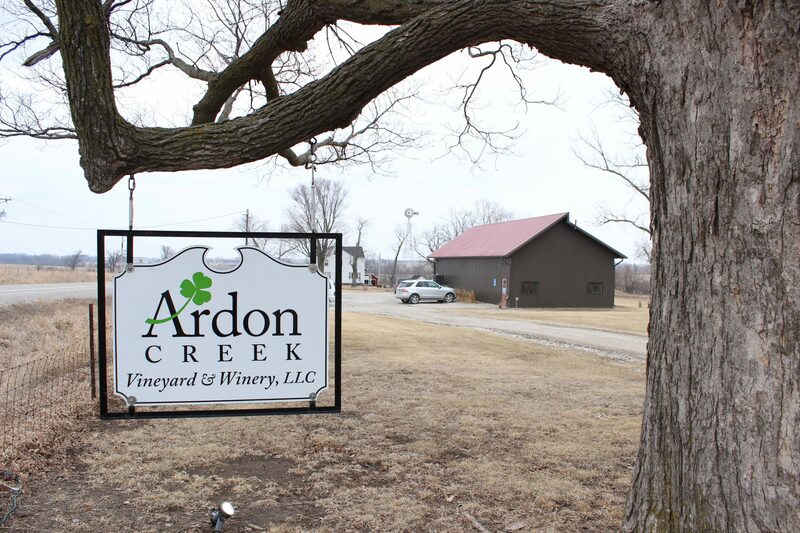 The vineyard and the cooperage are in rural Ste. Genevieve county and are not open to the public. The tasting room in downtown Ste. Genevieve, Missouri, is within walking distance of many historic homes including several built by French settlers in the 1700’s. The Mississippi river town is the oldest French settlement west of the river and was settled in the late 1740’s. Ste. Genevieve was controlled by Spain after 1762, but retains much of its French character today, including Saint Genevieve Winery. Next story Iowa Tourism Running Wine Ads in Chicago, KC and Mnpls.